By virtue of its north by northeast pathway, the Shawnee Trail passed through the western portion of Ellis County on its route to Missouri crossing the Brazos River at Waco, then the Trinity River at Dallas, and on to the Red River crossing at Preston. The trail followed a natural route well suited to driving cattle. Ellis County, along with other counties on a swath from below San Antonio to the Red River, lies within the Blackland Prairie, one of ten ecoregions in the state of Texas. Situated between the Cross Timbers to the west and the Post Oak Savannah and Piney Woods to the east, the hills and forests that flank the Blackland Prairie region made trailing cattle through the areas difficult, while the Blackland Prairie is gently rolling to level, making the central corridor an easier transportation pathway to trail cattle.3 In addition, the land cover of the region during the 19th century was predominantly tallgrass prairie, providing ample forage for cattle on the long journey north.4 The final component needed was plenty of water. In 1851, Nicholas P. Sims (August 15, 1806-May 24, 1902) and his siblings John Dabney Sims (1802-April 1878), Mariah B. Sims (1809-September 17, 1882), and Lucy P. Sims Brack (March 13, 1814-March 13, 1886) with husband Ezekial Marshall Brack (January 13, 1815-November 1, 1888) migrated to Ellis County from Mississippi settling along an extended stretch of Chambers Creek.8 Brack and his relatives settled just south of Greathouse on Machete Spring, later called Brack Springs, near what became the Boz-Bethel area in southwest Ellis County. Nicholas P. Sims soon moved farther south on Chambers Creek and purchased acreage that was to become the foundation for the L.R. Campbell Ranch, later known as the Pecan Springs Ranch. 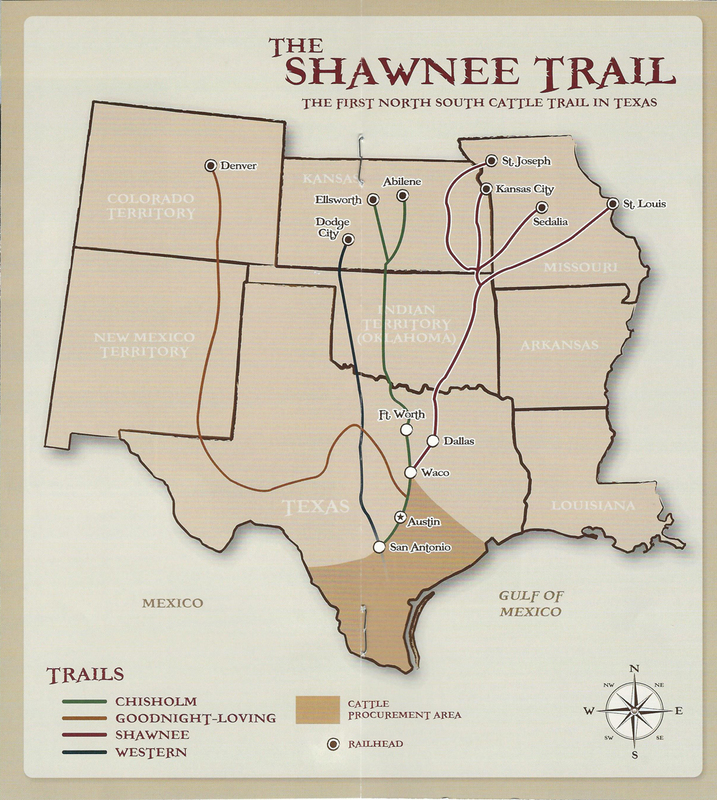 Even though the Chisholm Trail then became the major route for Texas cattle traveling to northern markets, drives up the Shawnee Trail lasted until 1873. Cattleman George Washington Saunders (February 12, 1854-July 3, 1933) gathered the stories of old drovers who trailed cattle in Texas and several mentioned their experiences on the Shawnee Trail, either specifically or by inference to their route through Ellis County. Although the short-lived Texas cattle trails forever sealed the public’s image of the American cowboy and western culture, the Shawnee Trail in particular served a more significant purpose as only one facet of an historic transportation corridor through Ellis County. Following a previously used Indian trail, Col. William Gordon Cooke (March 26, 1808-December 24, 1847) led an expedition in 1840-41 to cut a military road between Austin and the Red River through the central part of the new Republic, passing through what became Ellis County. 28 In 1842, William Ross Howe (?-1847) was the first white settler to build a house in the area on the north side of Chambers Creek bordering Cooke’s military road. His home was the first stage and mail coach stop for North Central Texas by authority of the Republic.29 Howe’s original survey is situated in close proximity to today’s Pecan Springs Ranch. Howe was only one of a long line of emigrants from the Midwest to make their way to Texas. Thousands travelled south on what was called the Texas Road in the mid 1800s. This corridor from the Red River through Dallas, Waco, and Austin was the same route followed northbound by drovers on the Shawnee Trail.30 After Ellis County was formed from Navarro County in December of 1849, the first commissioners began planning county roads. One of the first proposed in October of 1852 near the cattle trail was a “road leading from the town of Waxahachie in the direction of the town of Waco…crossing Chambers Creek at or near Sims Camp Ground,”31 which would have been the original settling location of the extended Sims family when they relocated to Ellis County. By the onset of the Civil War, there were thirty-one stage lines operating in Texas, and two of them ran through Ellis County. The route on the western side of the county also closely followed the Shawnee Trail from Waco through Waxahachie and Dallas.32 When the Missouri, Kansas & Texas Railroad (MK&T) entered Ellis County in 1890, it too roughly followed the old military road and cattle trail through Milford and Italy “northward to Chambers Creek and Ellis County’s oldest community (Howe’s Settlement)…renamed Forreston”33 to Red Oak before entering Dallas County. This historic and significant thoroughfare, once occupied by the Shawnee Trail which saw thousands of head of Texas longhorns course their way through Ellis County on the first of the major cattle trails of the Old West, has done much over the last 175 years to enhance the progress and prosperity of Ellis County. Many thanks to Ms. Sharan Farmer, B.A., for her historical research contributions about Pecan Springs Ranch and Ellis County. Ms. Farmer submitted the narrative for The Shawnee Cattle Trail to the Ellis County Historical Commission and the Texas Historical Commission. 1 Gard, Wayne. “The Shawnee Trail.” The Southwestern Historical Quarterly, January, 1953. Texas State Historical Association. The Portal to Texas History. Web. 8 July 2015. pp. 359-360. 2Texas State Gazette. (Austin, Tex. ), Vol. 1, No. 46, Ed. 1, Saturday, July 6, 1850. Austin, Texas. The Portal to Texas History. Web. 8 July 2015. 3 “Texas Ecoregions.” Texas Parks & Wildlife Department. N.p., n.d. Web. 7 Aug. 2015. 4 Auch, Roger F. “Texas Blackland Prairies Ecoregion Summary.” Land Cover Trends. U.S. Geological Survey, 28 July 2014. Web. 7 Aug. 2015. 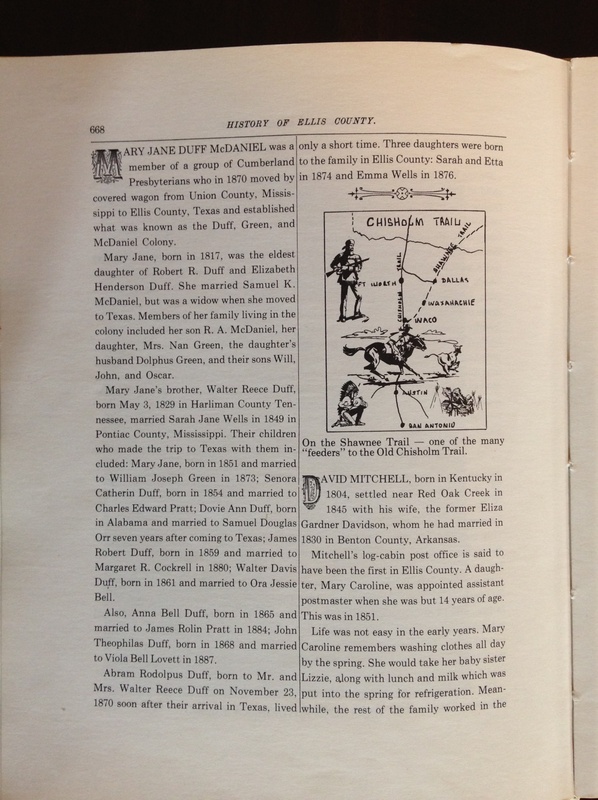 5Memorial and biographical history of Ellis county, Texas ... Containing a history of this important section of the great state of Texas, from the earliest period of its occupancy to the present time, together with glimpses of its future prospects; with full-page portraits of the presidents of the United States, and also full-page portraits of some of the most eminent men of the county, and biographical mention of many of its pioneers, and also of prominent citizens of to-day. Chicago: Lewis Publishing, 1892. Print. p. 11. 6 “Mountain Peak.” USGenWeb Project hosted by Rootsweb. 2002. Web. 10 Aug. 2015. 7 Caddel, Jean. “The Historic Springs of Ellis County.” Ellis County TXGenWeb, part of USGenWeb Project hosted by Rootsweb. 2001. Web. 7 July 2015. 8Farmer, Michal Martin. “William Sims born, say, 1655, will made 18 December 1710, James City County, Virginia and his Descendants.” Michal M. Farmer, 2011. Web. p. 90. 24 Aug. 2015. 10 Caddel, Jean. “Texas Cattle Trails.” Ellis County TXGenWeb, part of USGenWeb Project hosted by Rootsweb. N.d. Web. 10 July 2015. 11 Norris, Frank. “Cattle Trails—Statement of Significance” (Preliminary Working Draft). N.p., 20 March 2012. Web. 9 July 2015. 12 Saunders, Tom B., IV. The Texas Cowboys: Cowboys of the Lone Star State. Ketchum ID: Stoecklein, 1997. Print. p. 25. 13 Gard, Wayne. “The Shawnee Trail.” p. 366. 14 “Homer Duncan Company (1857).” Mormon Pioneer Overland Travel, 1847-1868. The Church of Jesus Christ of Latter-Day Saints, 2015. Web. 14 July 2015. 15 Gard, Wayne. “The Shawnee Trail.” p. 368. 16 Gard, Wayne. “The Shawnee Trail.” p. 368. 17 Gard, Wayne. “The Shawnee Trail.” p. 369. 18 McCoy, Joseph G. Historic Sketches of the Cattle Trade of the West and Southwest. Kansas City: Ramsey, Millett, Hudson, 1874. Web. 8 Aug. 2015. p. 20. 19Worcester, Donald E. “Chisholm Trail.” Handbook of Texas Online. Texas State Historical Association, 12 June 2010. Web. 18 Aug. 2015. 20 Hunter, J. Marvin, and B. Byron Price, eds. The Trail Drivers of Texas: Interesting Sketches of Early Cowboys and Their Experiences on the Range and on the Trail during the Days That Tried Men's Souls, True Narratives Related by Real Cowpunchers and Men Who Fathered the Cattle Industry in Texas. 1924. Austin: University of Texas Press, 1985. University of Texas Libraries. University of Texas at Austin, 23 Mar. 2011. Web. 4 Aug. 2015. pp. 590-592. 26 “Texan Cattle.” The Emporia News. (Emporia, KS. ), 28 Jan. 1870. Chronicling America: Historic American Newspapers. Library of Congress. Web. 7 July 2015. 27 Gard, Wayne. “The Shawnee Trail.” p. 376. 28 Britton, Morris L. “Military Road.” Handbook of Texas Online. Texas State Historical Association, 15 June 2010. Web. 12 June 2015. 29 Lavender, James A. The Early Settlement of Ellis County and a Biographical Sketch of the William R. Howe Family. Dallas: n.p., 1941. Granville D. Edwards and Patrick Howe Edwards, 2011. Print. pp. 14-15, 19. 30 Gard, Wayne. The Chisholm Trail. Norman, OK: University of Oklahoma Press, 1979. Web. 18 Aug. 2015. p. 26. 31Ellis County Commissioners Court Minutes. Vol. A, 1850-1857. County Clerk’s office, Ellis County, Texas. p. 76. 32 “Stage-Routes in Texas.” The Texas Almanac for 1861. n.p.,1860. Texas State Historical Association. The Portal to Texas History. Web. 7 Aug. 2015. p. 225. 33Ellis County History Overview. Compiled for the U.S. Department of Energy in support of the Superconducting Super Collider Laboratory. Rootsweb, n.d. Web. 7 Aug. 2015. 36 “U. S. Highway No. 0077.” Texas Department of Transportation, 2015. Web. 8 Aug. 2015. The map on this page is the only mention of the Shawnee Trail in published Ellis County history sources other than Jean Caddel’s online county histories previously documented. However, the caption is misleading. The Shawnee Trail was not a feeder trail to the Chisholm Trail, but an independent cattle drive trail in its own right. Ellis County History: The Basic 1892 Book (with the Presidents Section deleted) with Additional Biographies compiled by the Ellis County Historical Museum and Art Gallery, Inc. Waxahachie, Texas, In Memory of the Courageous Pioneers and Builders of Ellis County. Fort Worth: Historical Publishers, 1972. Print.